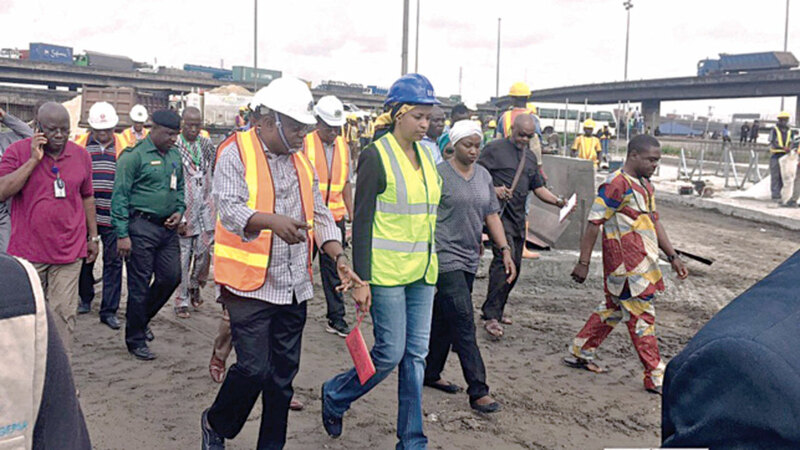 Managing Director, Nigerian Ports Authority (NPA), Hadiza Bala Usman (middle), inspecting the construction works on Apapa Wharf road, Lagos. Available evidence revealed at the weekend that only about two per cent of construction work had been done of the two-kilometre Wharf Road, which started mid-July. 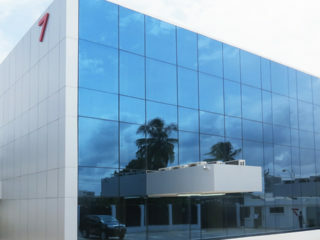 The Managing Director, Nigerian Ports Authority (NPA), Hadiza Bala Usman, who revealed this during a site tour of the route, said the construction company – Messers AG Dangote Construction Company, is working far below expectation with poor mobilisation of the workforce and equipment. This comes as the Lagos State Government barred the articulated vehicles from entering the city centre.Usman said: “Construction commenced on the 17th July, 2017. They have not being able to reach optimal performance as expected. They are still within one – two per cent completion, and one – two per cent of what they are required to deploy within this period. “They have stated the concerns and constraints they have around location of utilities. They have identified gas pipelines found underneath the road works, they are working on relocation. They have also identified electric cables and poles that need to be relocated. So, they are working on doing that. I have made them to understand that the level of performance is unacceptable, they need to increase and deploy more efficiently,” she said. 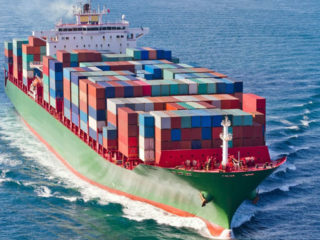 Usman argued that the role of Holding Bays in decongesting the traffic grid lock in Apapa is critical, pointing out that a licensing regime on the subject is being perfected between the NPA and the Lagos State Government. This is to enable operators in this regard to have access into the ports and function under guided directives. Lagos State Commissioner for Information, Steve Ayorinde, said the ban on trucks would hold until the completion of the construction works on the Ports access roads. He regretted that the incessant traffic bottleneck had impacted negatively on the commercial activities of the citizenry, adding that the directive would be enforced to eliminate the current hardship being faced by motorists. At the Coconut axis, the tanker drivers yesterday took over the road completely, while rushing to load petroleum products at their depots, leaving container truck drivers to ply one way to load containers at the Tin Can Island Port. Both sides of the road were completely at a standstill, as trucks and other vehicles heading to Mile 2 from Liverpool could not move, as they were blocked with trucks and other vehicles plying one way while heading to Apapa and Tin Can axis. 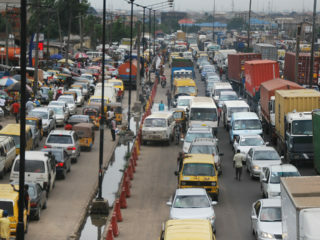 Checks by The Guardian reporters, who were in the areas to monitor traffic flow, showed that some security operatives including officials of the Nigeria Police Force, aided the movement for the trucks to ply one way. This was because the other side of the road leading to Tin Can was used as parking lots for tankers from Berger bus stop up to Coconut thereby disrupting movement for truckers to access the Ports.